Lush is possibly one of my all time favourite brands for bath and shower time; their products never fail to impress with their incredible scents and stunning appearance. And best of all - they're cruelty free! One thing I love especially is their thematic collections, and my favourite of all? Their Christmas collection of course! After payday I took the opportunity to head over to Lush's website and pick up some old faithfuls and some soon to be loves. So after browsing the various wonders in Lush's Christmas selection, I settled on seven products all together. The majority of my mini haul consisted of bath bombs, for no other reason but the fact that I bloody love to jazz up a bath. I went for the Butterbear, Shoot For The Stars and Star Dust bath bombs, they were the ones that caught my attention and the prices were incredible! Butterbear bath bomb firstly, looks SO adorable, and secondly has a beautiful blend of cocoa butter and vanilla to create a moisturising, luxurious bath at the tiny price of only £1.95. Shoot For The Stars contains brazilian orange oil and bergamot, providing the perfect winter spice smell to bring some festivity to bathtime! Star Dust is SO pretty, I actually used it in the tub the other night and it turned the water blue AND, it leaves little multicolored stars in the water! I love a good bubble bar, especially the fact that they can be used over a few bath times. I tend to break up my bubble bars to get as much use out of them as possible - I just love them, okay? I picked up Candy Mountain and The Magic Of Christmas. I must admit I couldn't resist getting candy mountain due to the fact it carries the snow fairy scent aka my love. The Magic Of Christmas bar comes attached to a cinnamon stick with the cutest winter bell and ribbon, perfect for the festive season. As well as being doused in gold glitter, the bar smells like winter to me; the combination of cinnamon and almond gives this product the most amazing spicy scent. I've actually never tried a bath melt from lush, so I couldn't resist when I saw the Snow Angel melt on their website. So appropriate for the season. To me, this smells like a mix of shea and cocoa butter and I can't wait to use it. I couldn't do a Lush haul without picking up the Snow Fairy body wash, could I? Snow fairy is hands down my favourite scent from Lush. I don't know what it is about this specific smell, but it's just so GOOD. Every year when Christmas is upon us I pick up a bottle of this and guard it with my life - anyone else have siblings who just love to use up your products? I'll probably end up getting another one of these before the season is up, but if you haven't smelled snow fairy, do it - thank me later! So that's it for my little festive haul. Ahh I'm desperate for a trip to Lush! I wish we had Lush here!! I would definitely spend a whole afternoon in this shop!!!! 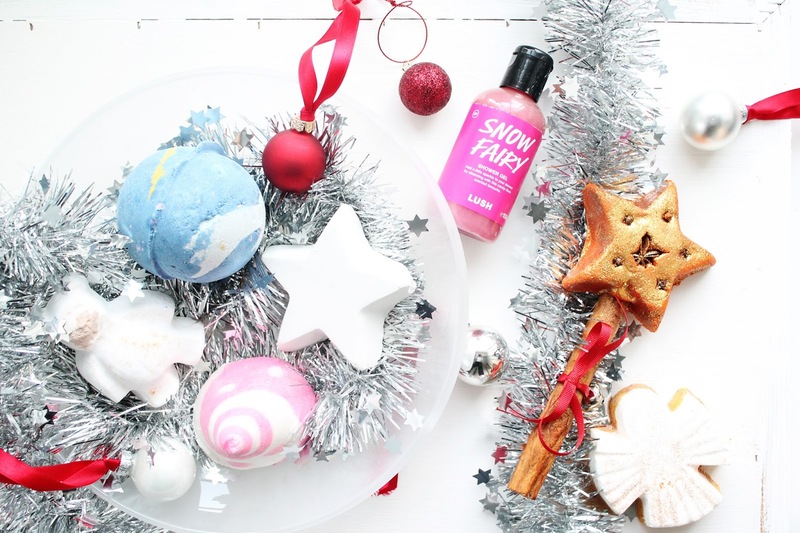 Snow fairy is the ultimate christmas scent! so many of my favorites in here. gotta say, i love butter bear and star dust. both smell heavenly. OH my goodness I love so many of these already and cannot wait to try what I haven't already! Butterbear and Candy Mountain are already my favorites and I have been DYING to try Snow Fairy. I've only head good things about it and I'll definitely have to hide mine from my sister as well haha! 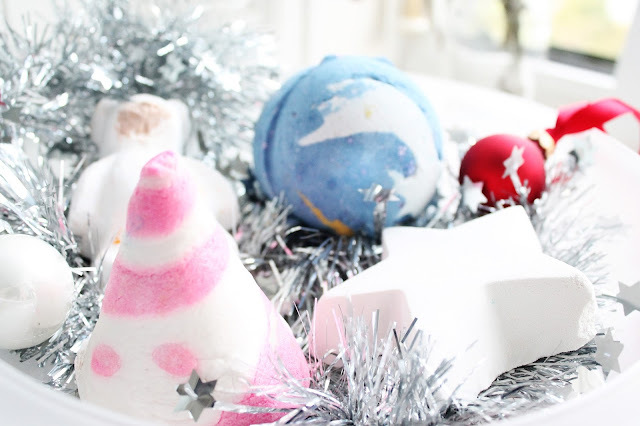 oh my, I would be more than happy to receive anything lush for christmas! Though i don't have a bat h which means I can't try bath bombs from there and it makes me so sad everytime I think about it!! All of these look so pretty, I really have to try some of Lush products finally! I miss having a bath so much! :( Reading post like this make me so jealous!